We are committed to making a positive impact on the communities we work in by providing employment, and through supporting local suppliers and charities. Our community investment focuses on projects to promote healthy eating. Our main partnership is with the Children’s Food Trust, a UK registered charity that aims to improve the food our children eat, with funding for its Let’s Get Cooking Clubs for teenagers. During 2016, SSP funded the clubs in 10 further education colleges in the Greater London area. 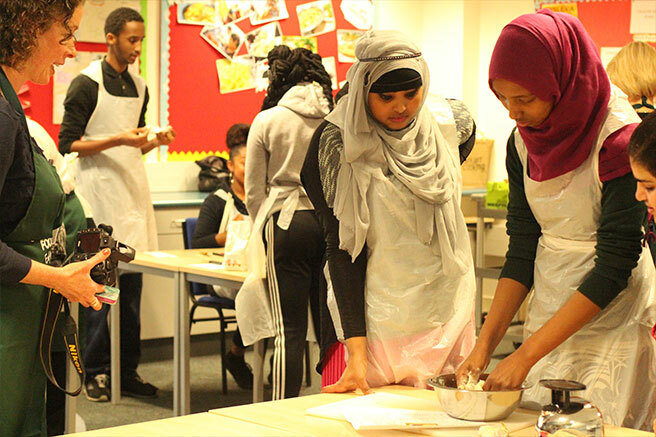 In each college, 16-18 year olds attended four sessions, learning how to cook simple and healthy meals, how to budget for food, and how to use up leftovers and avoid waste. Following positive feedback from the trial, we are working with the SSP Foundation to extend the project to a further 20 colleges, with the aim of reaching over 4,000 students over the next two years. Our units support a wide range of local charities, usually nominated by our colleagues or our clients. This year charity projects have ranged from SSP Spain’s support for the Association Against Childhood Cancer, to SSP America’s fundraising for a Phoenix children’s hospital. In the UK, the SSP Foundation (registered charity no. 1163717) is the focus for our fundraising activity. The Foundation works with partner charities on projects to promote healthy eating and supports employeenominated charities in the communities where SSP operates.